Appropriately, you’re live-tweeting hanging out with your friends in the desert, making amazing meals and rock-n-roll. And here I am, live-tweeting about hanging out with my friends in a desert, making amazing meals and….live action roleplaying? Ok, your friends are way cooler than mine. It’s ok, I’m not jealous. Last weekend I went to a live-action role-playing game. Yeah, I know it’s nerdy, but man, I get to dress up like a viking and hit other nerds with an axe. If you called it “therapy” you could charge a fortune, and it would be just as gratifying. Still, I didn’t want to get too far behind on my project again, so I figured I better keep up and cook something while camping. I picked the Chacroute Garnie because most of the stuff I could pre-cook at home, and then just heat up on a grill at the campsite. This worked out very nicely, as it happens. I couldn’t find any smoked pork tenderloin locally, so I just made my own. I’ve got a smoker in the back yard, so I got some pork tenderloin, brined it for a couple of days in salt, sugar, thyme and juniper berries, as per the recipe I found online. Unfortunately, I had neither alder nor ash to use for the smoking, so I just stuck with my usual hickory. (Mesquite is too strong for something like this.) I also spent a good chunk of the previous week making sausages, so I had home-made sausage to take for the “glistening pile of pork”, too. These particular sausages had chicken, pork, garlic, plum, ginger and soy – making them taste something like the inside of a dumpling. After getting cooked on a mesquite fire, they had a smokey flavor that balanced the Asian-ness of them so they worked just great. I’d also pre-boiled my potatoes. So then, during a break in the action, I put the kraut and potatoes and salted pork belly in one pot, the sausage, smoke tenderloin slices in the other, and arrayed the frankfurters on the grill between the pots. This particular campground has an interesting history. It’s currently a Boy Scout camp, nestled into the hot, arid canyons North of Los Angeles; but originally in the 50’s, it was owned by, I kid you not, Nazi 5th columnists, who used it to train their insurrection forces meant to assist the Germans when they landed their invasion forces. Obviously that didn’t work out too well for them, neither the sympathizers nor the Germans, and so our shores remained cheerily Nazi-free. But it’s a great campground and a perfect site for epic battles of good vs. evil. 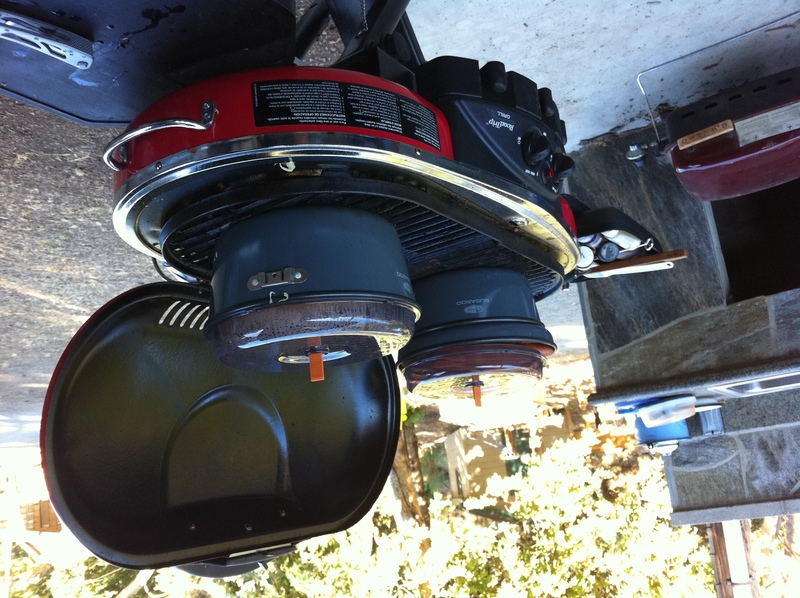 Campfire cooking at its easiest! I started the whole thing with duck fat, onions and garlic – the aroma of which brought my hungry friends, starving after a hard day of hitting each other with foam weapons, sniffing around the pot for a taste. I have to say it was really excellent, and easy to put together in the field. Most of the work was front-loaded, and the assembly was just the sort of thing to accompany an ice-cold beer (and a bit poured into the kraut) and lounging in the shade for a while.Of course, sauerkraut does have a notorious side effect, and let me tell you, nothing is quite so embarrassing as noisily breaking wind while kneeling before the Queen of the Elves… but I can’t hold you responsible for that, Chef. Anyway, it was dark and no one knew it was me. I’d call this one a hit – in fact, a MIGHTY BLOW PLUS FIVE! That’d make sense if you were a nerd, chef. Or at least a nerd that did Dying Kingdoms, which you totally ought to try. P.S. 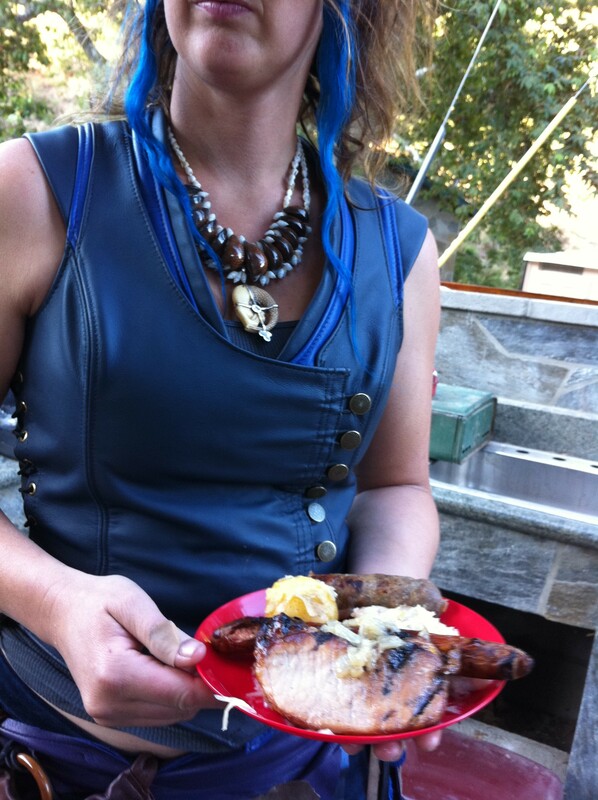 that’s totally my wife, dressed like an elf, eating a glistening pile of pork. I’m a lucky dork!